The National Museum of Women in the Arts in Washington, DC is constantly asking their guests if they can name five women artists. But what about inventors? Activists? Musicians? Women's History Month is the time to reflect on the women who have changed the world, but that shouldn't end in March. That's why this month our editors decided to recap the most underrated women in history who changed our lives. The last queen of Hawaii served for just two years, but played an influential role on our 50th state. She was born into royalty and sent to a Royal School surrounding by others eligible for the throne. She became queen after her brother's death at a very tumultuous time for the country. The Bayonet Constitution was being enforced by outsiders to force out the monarchy and the Dole family (aided by the United States) threatened the country with battle. Lili'uokalani surrendered to Dole, the fruit giant that's still in your local grocery store today, in 1893, but Hawaii did not become a state until decades later in 1959. Lili'uokalani persevered through corporate greed. The Bayonet Constitution, signed a few years before she became queen, not only transferred power from the monarchy to a state legislature, but also placed voting restrictions on native Hawaiians. Lili'uokalani refused to legitimize this document, instead she pushed for a constitution that would give the power back to Hawaiians. Further, Lili'uokalani didn't surrender because she was 'weak,' she did so to protect her citizens by avoiding bloodshed and the loss of lives. Being a powerful ruler isn't all that Lili'uokalani is known for. She was also a songwriter, most famous for “Aloha Oe (Farewell To Thee),” a song that has been interpreted as a farewell to her country after she surrendered the throne. We've all heard of the men that first stepped foot on the moon in 1969. We seldom remember the women on the ground that made the mission possible. Hamilton was an instrumental director of the Software Engineering Division of the MIT Instrumentation Laboratory, contracted by NASA for the Apollo program. 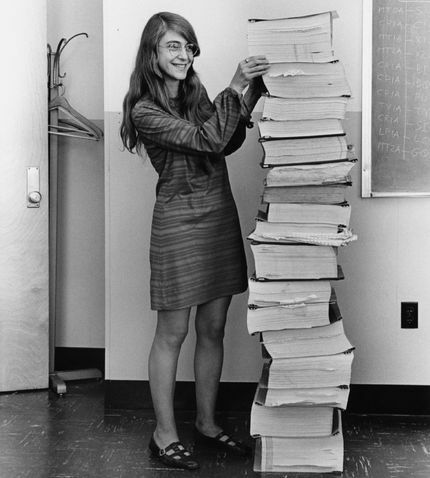 She led the development of the spacecraft’s guidance and navigation system and her team developed the framework for software engineering, and she worked tirelessly in testing Apollo’s software. As the director of the Software Engineering Division of the MIT Instrumentation Laboratory, Hamilton successfully led a team that was tasked with developing the software for the guidance and control systems of the in-flight command and lunar modules of the Apollo missions. At the time of her daunting task, there were not any schools that taught software engineering, so she created the term herself. Her leadership and educational abilities were crucial in the Apollo 11 mission, which took the first Americans the Moon. There are many authors who have inspired. There are many feminist authors that have inspired. But who was the first author and what impact did he or she have on the writing world we know today? I was happy to find out that the first ever known author, born in 2285 BCE, was a Sumerian woman named Enheduanna. Enheduanna’s writing style can be recognized in the centuries following her and it is through her original works that they are now recognized as prayers, psalms, and poetry. Enheduanna was the daughter of Sargon of Akkad or Sargon the Great and he entrusted in her a very important job, the most important job, in fact, in the Sumer temple: high priestess. Her job, which she held for over 40 years, entailed merging Sumerian gods with Akkadian gods to ensure the empire her father was ruling remained peaceful and stable. It was because of this position her writing had true impact and power. Enheduanna is best known for three works entitled Inninsagurra, Ninmesarra, and Inninmehusa. These translate to The Great-Hearted Mistress, The Exaltation of Inanna and Goddess of the Fearsome Powers and each of these hymns are for the goddess Inanna. Not only are these beautiful pieces of writing, however, but also served as a way to communicate with the gods to keep the peace in Enheduanna’s father's empire. In addition to hymns, Enheduanna had written over 40 poems which portrayed a more personal side as she wrote about her own dreams, fears during times of war and observations about the world she lived in. Ching Shih might not have necessarily made a morally sound career choice, but she was one hell of a pirate. A title normally reserved in our minds for Johnny Depp sporting too much eyeliner and hidden Blackbeard treasure, the real king - or shall we say queen - of the seas was Ching Shih. Like any good villiian, she controlled her fleet with impunity and directness. She terrorized the seas during the Quing dynasty (early 19th century) and commanded over 300 ships with approximately 30,000 pirates, making her the captain of the largest crew ever assembled. She entered into conflict with major nations, like the British and Portuguese empire, and is considered to be one of the most widely successful pirates in history. Perhaps most impressive, however, was Ching Shih's ability to evade a prosecution most pirates face. She was granted amnesty by the Chinese empire as a way to stop her piracy. This means that Ching Shih was one of the only pirates to die free and with a clean name. She even served as a military advisor during the First Opium War which broke out in 1839. She was able to have her deliciously devilish cake and eat it too. A senior and Editor-in-Chief of Her Campus at American who enjoys reading banned books and drinking overpriced coffee.